This garden was much admired by Gertrude Jekyll and mentioned in her book �Wood and Garden�. The neglected long borders were replanted in the Jekyll style and a stone paved terrace for eating out was built near the house. A raised pool and overflow provides interest and sound. An irregularly shaped pond detracted from the glorious view beyond in this Dorset property. It was replaced by the simple geometry of a circular pool which fits comfortably with the scale and geometry of the landscape. An ugly sunroom blocked views onto downland and divided the garden. 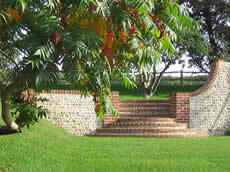 Having replaced this with a set of circular steps built of brick and flint it is now possible to watch grazing sheep from the newly created terrace along the back of this traditional Sussex village house. 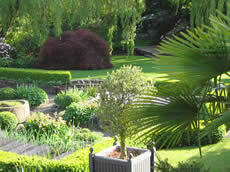 This sturdy stone Harrogate House has a sunken garden and therefore despite its position is surprisingly secluded. 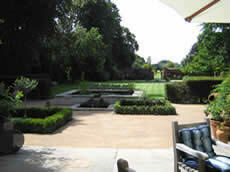 A central vegetable area was replanted more decoratively with views to a watercourse that crosses the garden. 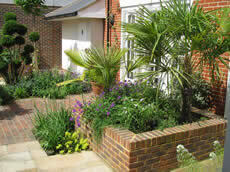 The smaller the garden, the more important it is that it should function as an additional room to the house it adjoins. 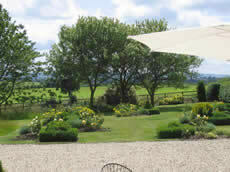 Whilst providing usable space, the area also provides attractive views from inside the house. Strong plant and foliage forms contrast well against high, brick surrounding walls. 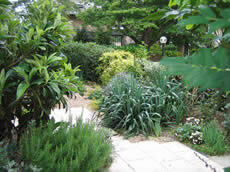 A retired lady moved to this ground floor apartment and wanted a comparatively maintenance free garden. The main areas of the garden are laid with consolidated gravel and bold shrub plantings, much of which is evergreen, provide structure and all round interest. A myriad of pots provide flower colour.